Commercial radiative heating systems are very complicated, and the boilers required for them to work can and will degrade over time. Even when commercial boilers are routinely maintained, faults can occur. When this happens, you need the boiler repair experts at Front Range HVAC. It’s not always obvious what repairs are needed when a boiler goes down. To the untrained eye, a malfunctioning boiler might seem like it just needs to be replaced. However, this might not be the case, and it’s quite possible that a well-executed commercial boiler repair job could help you squeeze an extra few years of operation of your commercial boiler. Front Range HVAC has the proven experience needed to ensure that your boiler is accurately diagnosed. Leaky, dripping, or corroded joints or connections. This is probably the most common symptom of malfunctioning water heating systems. Thankfully, most leaks can be repaired without much downtime. Inefficient heat distribution. 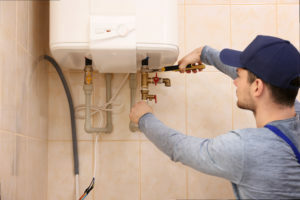 If you’re noticing that hot water isn’t getting from your boiler out to the radiative appliances located throughout your building, a repair might be needed. Hissing, gurgling, or popping sounds coming from the boiler area. This is almost always a clear indication that there is an issue with water flow to or from the boiler. Any time a Front Range HVAC technician performs a diagnosis on a malfunctioning boiler, expert attention is given to every component. And, because we have a direct line to the manufacturers of high-quality boiler repair parts and materials, we can normally acquire the repair equipment we need within days. Expert commercial repairs performed by trained technicians who go the extra mile—that’s the Front Range HVAC difference. If your commercial boiler is problematic and you want the best boiler repair service in the business, contact Front Range HVAC to schedule an on-site appointment. Our HVAC professionals will diagnose the issue, recommend the needed repairs, and keep you informed on the project status every step of the way. Call us today at (303) 942-1372.